During the height of California’s highway boom from the 1950s through the 1970s, Caltrans bulldozed through hundreds of neighborhoods to construct freeways. The economic and environmental toll on these communities was far-reaching: while freeways benefitted the development of outer-ring suburbs, their expensive construction divided and blighted existing neighborhoods, displaced thousands of residents, and contributed to the air pollution challenges that many California cities are seeing today. For these reasons, by the early 1970s, freeway revolts in San Francisco, Los Angeles, and other cities halted urban freeway construction, and then-Governor Jerry Brown officially ended the state’s freeway expansion program. While some freeway expansions continued into the 1990s, California’s urban development paradigm has shifted: cities are increasingly focused on expanding sustainable transportation options which support the state’s goals to reduce greenhouse gas emissions, and vehicle miles traveled per capita has fallen over the past decade. Many cities including San Francisco and, more, recently, West Sacramento, have actually removed freeways. Reminiscent of a bygone era that put freeways over people, Bakersfield is moving forward with a $570 million freeway segment of the Centennial Corridor project that will cut through the city’s Westpark neighborhood and displace an estimated 961 people, 310 residences, 121 commercial properties (Alternative B, shown in the map below). 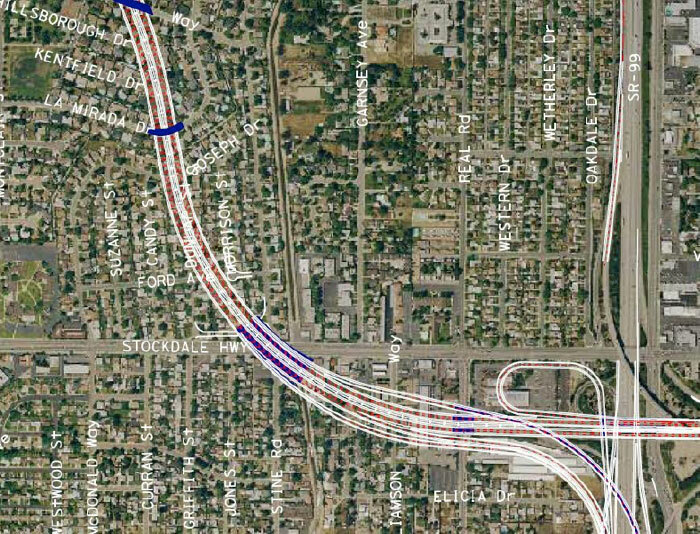 The destruction will extend beyond the physical path of the freeway, as adjacent residents will experience an increase in noise and pollution-related health issues, and potentially a decrease in property values. Needless to say, the community is fighting back, but they have a tall order ahead of them. Originally a relic of Caltrans’ 1950s era vision for a continuous Interstate 40 connection to I-5, Caltrans and Bakersfield are pursuing the Centennial Corridor project in the name of congestion relief – strange, in a city where little to no traffic congestion exists. Most of the project’s funding comes from federal sources ($330 million), while the rest comes from bonds and loans. The middle segment, the Westside Parkway (shown as Segment 2 below), was recently completed at a cost of $240 million. In total, Segments 1 and 2 will cost over $800 million, while the entire Centennial Corridor project will cost well over one billion dollars. Above: Map of the Centennial Corridor Project phases. Alternative B was selected by Caltrans as the Preferred Alternative despite the fact that it will displace an estimated 961 people. Below: Aerial of the recently completed Westside Parkway. The tragic irony of this project is that Bakersfield is the most polluted city in the country while Kern County is one of the most unhealthy in the California – more than 60 percent of residents are obese and suffer from associated health issues like heart disease and diabetes. Rather than investing a billion dollars to build a transportation system that reduces air pollution and promotes healthy, active lifestyles, Bakersfield is flushing away taxpayer money on a project that will perpetuate the status quo and ignore the city’s serious challenges. In 2014, it’s hard to understand how the Centennial Corridor makes sense. It will cost $800 million to offer a couple minutes in time savings for outer suburban areas that mostly don’t exist yet. It disregards the property rights of homeowners and will bulldoze through an entire neighborhood. It perpetuates a sprawling development paradigm that contradicts the intent of SB-375 and exacerbates the already heavily polluted environment facing a significant public health crisis. It’s as if the last 75 years of urban history didn’t exist. As California transportation policy shifts to support active, sustainable, livable communities, the Centennial Corridor exemplifies how the status quo remains alive and well. One would hope that Bakersfield policymakers will recognize the limitations of the Interstate Era and the need for a more multimodal outlook; however, at the current rate of progress, this realization could be a few decades away. Build it. We need it. I hope the people would stop delaying the project. The city need it. It is not true that there is no traffic. There is a lot of traffic. It is not as bad as LA but we should not wait for traffic congestion to get worst before we act. No–we do not need it. We are not even close to being anything like LA. Build it or wait till the population is Overwhelming then the cost will be too high to build. Obviously this will be built one way or another and there is no need to complain about it. There are plenty or roads left to leave Bakersfield for good if anyone chooses to. Why does everyone not want to see there city grow? We all live here by choice, either leave or stay. The reactions of some of the people on this page sicken me. You would displace hundreds of people and destroy hundreds of homes and businesses, just to cut five minutes off of a commute? If your home was in the path of a highway project, I guarantee you’d be singing a different tune. “We need it.” You selfish, selfish man. My home was up on the chopping block for this project. My friends’ home is going to have this waste of taxpayer money and concrete practically in their backyard. You didn’t have to worry about being displaced and given a paltry sum for your home. You don’t have to endure noise and air pollution from the construction equipment while they build that road. Do you really need it? Do you really need that damned road so badly? So our traffic needs to be as bad as LA before we do something about it? That’s a terrible idea and is reactive instead of proactive. Bakersfield is growing every year and eventually this would have to be done. Why wait?